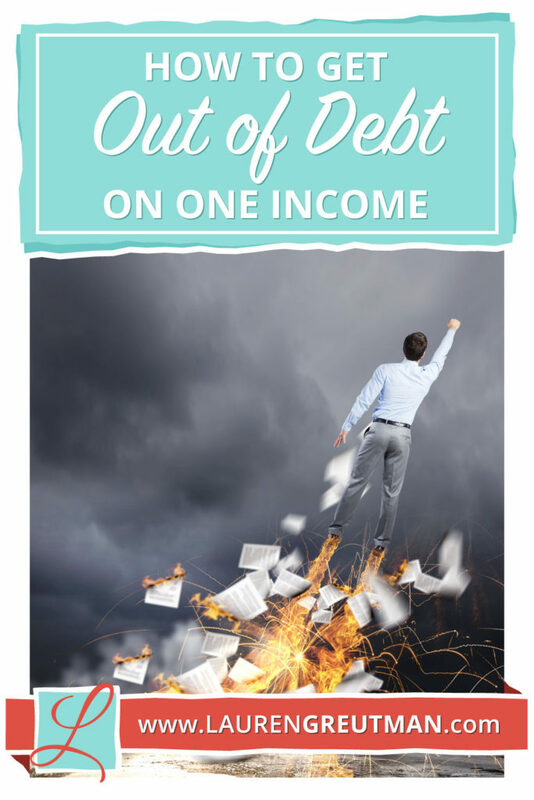 How to get Out of Debt on One Income - 6 steps that anyone can do! If you are living on one income, paying off debt may seem impossible. But, don't lose hope! If you've been wondering how to get out of debt on one income, here's some great steps to get you going! The first place to start is to step back and evaluate your lifestyle choices as well as your habits. Do you enjoy the dinners out on the weekends? Are you frequently splurging on a $25 bottle of wine? Do you grab a smoothie every time you are out running errands? There was a time in my life where I always ran through a drive-thru to grab a Coke anytime I got into the car. It was a habit that developed over time and eventually, sitting in my car made me immediately crave a Coke. I needed to get my finances under control. When you're spending $1 or $2 at a time it doesn't seem like much, but these small purchases all add up! These are the things that take most of your extra cash that you can use to tackle that debt! I like to think of these things as leaks in my financial bucket. If they are not taken care of, eventually everything will leak out, and then you'll be tempted to go into more debt. This is what we're trying to avoid. Print out the last month or two of bank statements and make a list of everything you spend your money on. This step takes some time, but it will be worth it! An even faster way to do this is to sign up for Tiller. Tiller will automatically import and organize your expenses into a spreadsheet that will be much easier and faster for you to manage. After the free trial, it is $5 a month, but it is well worth it, especially if it helps you see where you can save hundreds in your budget. Next, make a new list of everything you can cut out immediately. Unfortunately, this is the ‘fun' stuff that we really like spending on. It's OK. Take a deep breath, remember the goal of getting out of debt and put some of those extras on the chopping block for the time being. Next, write down your total take-home pay (after taxes) and when your paydays are. Review your misc expenses from step 2 in Tiller or on paper, and add in the stuff you are not going to cut. 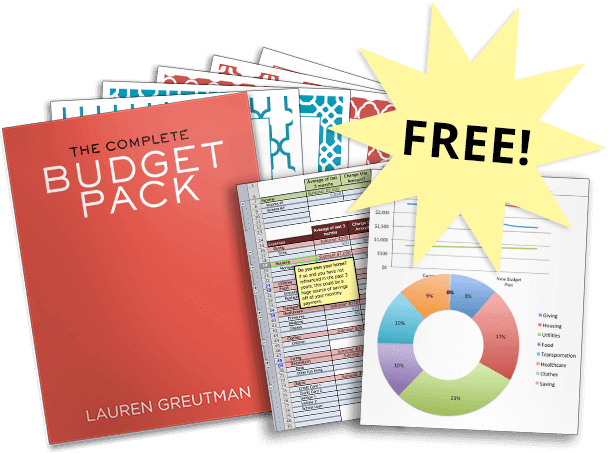 But let me make it easier for you… just download this FREE budget pack and get started! Trust me – this will help you out a lot! It might be helpful to use a budget planner if you prefer pen and paper to spreadsheets. When you created your budget, did your numbers add up? It’s possible that you have more going out than you have coming in. The goal of this step is to put as much money as possible towards your debt. This is where you need to do another round of cuts and ask, “What can't I live without?” These are the essentials. Everything else needs to – at minimum – be considered for cuts. But freeing up money isn't just about cutting things out. It's just as important to look for ways to save money on a tight budget. By saving money, you might be able to keep some things, but make them fit in your budget. Have you considered other ways to make money on the side? Here's a bunch of ideas to spark your interest in how to make money at home. And, if you have a smartphone, there are tons of ways to even make money on stuff you were already buying. Knowing how to get out of debt on one income is enough of a challenge on its own, so having intense focus on cutting back while trying to make some extra cash gives you bet chance for success. Since you've cut expenses and are looking at ways to bring a little extra income into your home, come up with a plan of attack. There are two ways for attacking your debt. You can use the debt snowball approach where you will pay only the minimum payments to all debts except the smallest one. All extra money will go directly towards your smallest debt and once it is paid off, you will roll the minimum payment for it and all extra money into the minimum payment for the next largest. Eventually, you’ll have a large payment for the final debts and they will quickly disappear. Focus on the debt that is costing you the most money. This means you target the debt with the highest interest rate first. You use the same principal, just in kind of reverse. But check it out – I've got a calculator that will give you a personal debt payoff plan using either method! Click HERE to get access. In my experience, most people prefer to tackle the smallest balances first because it gives them a sense of accomplishment and motivation to keep moving forward. If you're interested, I go into much more depth on debt reduction in The Financial Renovation eCourse. The key to understanding how to get out of debt on one income is that you are regularly evaluating both your expenses and your income. Keep an eye on places where you could save or make more money. Do you have items in your home you could sell to bring in some extra cash? Regular evaluation, especially if you have a partner, will help keep you motivated and give you insight into where you can make some more changes. Paying off debt with one income is not impossible. The most important step you can take (and keep taking) is to evaluate yourself. Evaluate your spending, your budget and your motivation, if need be. By being mindful of where your money is going, you’ll be debt free in no time! I am inquiring about the cost of a one time session or possibly two. my husband always has so I am going in to this feeling very reluctant and afraid. Jessica – I have a complete online Finance course where I walk you through how to budget and get your finances in order. It even comes with a free planner and FB group 🙂 TheFinancialRenovation.com is where you can find it. Laura, I would look at Credible.com first. Go to LaurenGreumtan.com/credible and they can help you out. Liked the article.I think that the most critical part of structuring your finances and optimizing savings is just having a plan. Whether you use a spreadsheet or a tool like Geltbox money– you have to get everything out in front of you so you can make smarter decisions. Once you do that, then implementing your disciplined savings strategy becomes critical.